Andy, Broker/Ow pany, is a second estate scion who over the company his father had founded in his wife, came to the industry via a 25-year ca and commercial banking, transitioning to real Andy is mainly management but does some s while Tammy focuses her energy on residentia have developed a system of communication nology to stay in sync with each other and w “We work well off each other,” says Tammy. other informed about what the other is doing, know the status of each other’s transactions. the team is Tammy’s dog Tilly, who accompa nies her owners to the office each day and ha her very own fan club. Accomack and Northampton Counties, the pai can boast a rate of repeat and referral busines that hovers around 90%. The reason for this explains Tammy, “is that we provide excellen Phone 888-461-3930 | Fax 310-751-7068 customer service. I developed a lot of thos mag@topagentmagazine.com | www.topagentmagazine.com techniques when I was working at the bank. No portion of this issue may be reproduced in any manner whatsoever without prior consent the publisher. 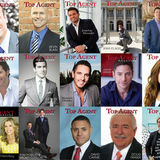 Agent follow of a client all theTop way through the transac Magazine is published by Feature Publications GA, Inc. Although precautions are taken to ensure the accuracy of published tion, and I help them through everything. I keep materials, Top Agent Magazine cannot be held responsible for opinions expressed or facts supplied by its authors. in contact with them even after the closing.” To subscribe or change address, send inquiry to mag@topagentmagazine.com. 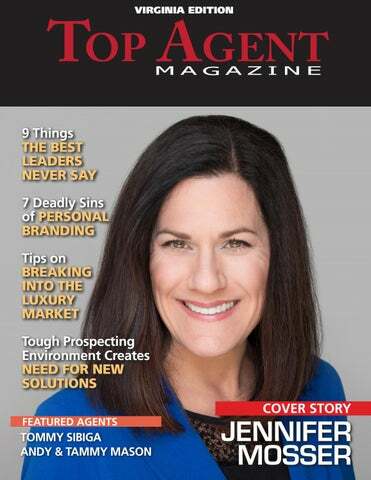 Published in the U.S.
call (571) 210 2210, email Jennifer@JenniferSellsLoudoun.com or visit jennifersellsloudoun.com www. from more “old school” methods as well, such as targeted postcards to neighbors. He’s also found word of mouth advertising to be very effective. What does Tommy love most about his work? “It’s a people business. I like working with people and building relationships. Buying a house is one of the most stressful things a person can go through. I like being even keeled and walking them through the process, helping to alleviate their stress. It’s nice to serve families out in that way.” To keep in touch with past clients, Tommy uses a variety of methods from handwritten notes and phone calls, to lunch or coffee dates. He’s also beginning to ramp up client appreciation parties and dinners. “I come from youth ministry, which is very relational. So I do anything and everything I can to develop and deepen my relationships with clients,” Tommy says with a smile. A strong believer in giving back to the community, Tommy makes generosity a high priority in his life. He remains involved with Young Life, volunteering on college campuses. He also volunteers with his church and plans to transition to spearheading more fundraising efforts there. In his free time, he enjoys running, lifting weights and cycling to keep in shape for raising his two young sons; and he loves spending time with his sons and his wife. For the future, Tommy hopes to continue to develop and train his team and hire new agents to further increase their ability to best serve their clients. “I want to teach them everything I had to learn the hard way,” he says with a chuckle. With his drive for providing excellent service and his track record of mentorship, he’s sure to succeed! To find out more about Tommy Sibiga, email tommys@htrsi.com or call 804.551.1702. You can also check out his website at tommysibiga.com www. For more information about Andy and Tammy Mason, call 757-787-1010, email Andy at andy@mason-davis.com or Tammy at Tammyvmason@gmail.com or check out our website mason-davis.com www.